Volcanic activity at Erta Ale discussed in the 5-11 October 2005 Weekly Volcanic Activity Report actually occurred at Dabbahu. The correct report is below. 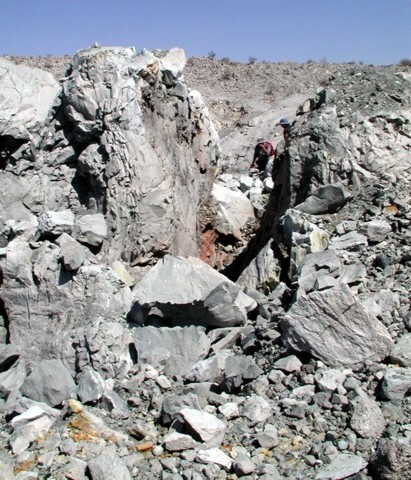 A team of scientists visited the Da'Ure locality immediately adjacent to the NE flank of the Quaternary Dabbahu (or Boina) felsic complex on 4 and 5 October after receiving reports of volcanic activity there on 26 September. People in the area noted that on 26 September at about 1300 a very strong earthquake shook the area, and was followed by a dark column of "smoke" that rose high into the atmosphere and spread out to form a cloud, which darkened the area for 3 days and 3 nights. The scientists determined that a minor explosive eruption occurred from two semi-circular vents, producing ashfall that was ~5 cm thick near the vent. Ash deposits extended more than 500 m from the vent. Boulders emitted during the eruption were as large as 3 m and were deposited as far as 20 meters away. The scientists noted intense degassing from the vents, the scent of sulfur dioxide, and the sound of boiling water in the vents. As of about 10 October, the Addis Ababa University Geophysical Observatory reported that seismic activity in the area was continuing. An eruption began on 26 September 2005 in the Afar triangle region of NW Ethiopia, near the Afar's W topographic margin, a spot ~ 330 km E of Lake Tan'a (the source of the Blue Nile river) and ~ 320 km NNW of the city of Djibouti. The venting took place on the flanks of Dabbahu (Boina), a volcano without previous historical eruptions. What follows is a brief synopsis of seismicity available from the USGS and some field observations from Gezahegn Yirgu, Dereje Ayalew, Asfawossen Asrat, and Atalay Ayele of Addis Ababa University (AAU). Shortly after the Bulletin editors received the AAU report, normal lines of communication were temporarily halted due to civil unrest. Consequently, this report was reviewed and augmented by Anthony Philpotts of the University of Connecticut, who had flown to Erta Ale and Dabbahu with them and other scientists on 16 October 2005. Dabbahu, a stratovolcano, also goes by several other names, including Mount Dabbahu, Boina, Moina, and Boyna. The eruption occurred at least 5 km NE of Dabbahu's summit area, at a flat spot referred to by the names Da'Ure and Teru Boyna. The profusion of names and spellings for this region of Africa partly stems from widely dissimilar alphabets; the one used in the region has over 100 letters, complicating conversion into languages having only 26. The Dabbahu eruption has been confusing. Initial news reports shed little light on the eruption's source, size, or impact. Several news reports stated that nearby earthquakes had caused an eruption at Erta Ale, which is 113 km N of Dabbahu, but that was not the critical eruption in this region during late September. (Seismicity, however, did appear associated with an elevated level of unrest at Erta Ale in October-see report in this issue.) The confusion propagated into the Smithsonian-USGS Weekly Report of 5-11 October 2005, which incorrectly attributed some details of the Dabbahu eruption to Erta Ale. A correction was issued and the report was withdrawn. Official sources and news reports also seem to have initially overstated the impact (e.g., statements like 50,000 nomads evacuated, almost 500 goats killed, etc.). In a later, more measured report, The Ethiopian Herald posted a 6 October article on the web that noted the following. "... the [Disaster Prevention and Preparedness Commission] has sent relief aid, household utensils and a tanker truck to areas affected by the natural disaster. A regional committee set up in charge of studying the magnitude of the disaster has already sent its report to the commission. According to the report, 1,215 quintals [121,500 kg] of food aid has been dispatched to 6,384 citizens displaced from Boya and Debawo ... and resettled in Debabo locality, 20 km from Teru. Some 18,234 various household utensils, 1,280 blankets as well as 119 roles of plastic sheets were being transported to the area." According to faculty at Addis Ababa University, prior to the eruption and in addition to the earthquake swarm there was also volcanic tremor, as well as faulting, fracturing, and possible local landslides. Earthquake swarm. During September-4 October 2005, an earthquake swarm consisting of 131 events occurred at and immediately surrounding Dabbahu (figure 1 and table 1). The swarm was sudden and comparatively intense, with magnitudes ranging from body-wave magnitude (mb) 3.9 to 5.2. Instruments registered earthquakes of both the highest number and magnitude during 24-26 September, just prior to the 26 September eruption. Seismicity in the area declined sharply on 27 September and stopped on 4 October. According to another data set, earthquakes occurred in the region during the 5 years prior to this swarm at an average rate of ~ 12 per year. Figure 1. A map showing Dabbahu volcano in the Afar triangle, along with epicenters from the earthquake swarm of 14 September to 4 October 2005 The solid triangles indicate Holocene volcanoes, although the one for Dabbahu is swamped by the pattern of epicenters. The Alayta shield volcano (labeled "A") sits 32.7 km NNE of Dabbahu's summit and erupted several times in the early 1900's. Epicenters were compiled from the U.S. Geological Survey (USGS) National Earthquake Information Center website. Table 1. Daily number and maximum magnitude of earthquakes located in the Dabbahu region during 14 September-4 October 2005 (up to 42 per day, with a total of 131 earthquakes). Mw stands for moment magnitude; mb stands for body-wave magnitude. Data courtesy of National Earthquake Information Center, USGS. First-hand observations. Gezahegn Yirgu of AAU submitted a preliminary description of the eruption. He reported that people in the area noted that on 26 September at about 1300 a very strong earthquake occurred. That was followed by a dark column of "smoke" that rose high into the atmosphere and spread out to form an umbrella-shaped cloud. Emissions darkened the area for 3 days and 3 nights. On their first visit, provoked by the abnormal seismicity, his team departed the site just two hours before the 26 September eruption. He went back to Dabbahu for several more visits, some of which included geologists from overseas. The visitors found that a minor explosive eruption had taken place from a fissure-vent system, producing a light-colored ash layer that extended over 500 m from the vent (figure 2). The eruption threw out pre-existing near-surface pyroclastic deposits (sediments) and felsic lavas, and redeposited them near the vent (figure 3). Some of the rocks that were thrown 20 m from the vent measured 2-3 m across. Fine white ash fell in the surrounding region as far as Teru village, 40 km SW of the eruption site. Figure 2. An aerial view of the fissure vent at Da'Ure (Dabbahu) taken around 4-5 October 2005, showing the post-eruptive scene captured by a camera that was aimed down and toward the NW. The fissure vent, which extends ~500 m and trends nearly N-S, cuts across the photo diagonally (for sense of scale, see people in figure 4). The deepest part, ~100 m below the surface, lies along the vent's base at its widest point. It exposes dark material at the bottom (see figure 3). N of that wide segment lies a cauliflower-shaped pumice dome, a feature ~30 m in diameter. What appears as a short, narrow segment of the fissure vent continuing in the distance behind (to the N of) the dome is actually longer and more prominent than it appears, owing to foreshortening due to camera angle, surface topography, and perspective to the more distant location. This northernmost segment of the vent is roughly one-third as long as the segment in front of the dome. Photo taken by Asfawossen Asrat. Figure 3. An aerial view of the fissure vent at Da'Ure (Dabbahu) taken around 4-5 October 2005, showing the post-eruptive scene captured by a camera aimed down and approximately NE. This image presents enlarged views of both the pumice dome and the fissure vent's lower portions. (For sense of scale, see figure 4). Photo taken by Asfawossen Asrat. Roughly two-thirds of the way from the S end of the fissure vent, a 30-m-diameter pumice dome formed. From within the fractures in this dome, the team heard a sound from below resembling the sound of a helicopter engine or a boiling liquid. The bulk of Yirgu's report on the second visit to the eruption site, on 4-5 October, follows. "A team of three geologists and one geophysicist (Gezahegn Yirgu, Dereje Ayalew, Asfawossen Asrat, and Atalay Ayele) revisited the Da'Ure locality (at approximately 120° 43' 37" N, 40° 32' 55" E) immediately adjacent to the NE flank of the Quaternary Boina felsic complex. This locality is the southwestern extension of the area we visited a week earlier and where we observed a number of newly opened parallel fissures and a major reactivated normal fault. "We first investigated the area where a volcanic eruption had been reported. 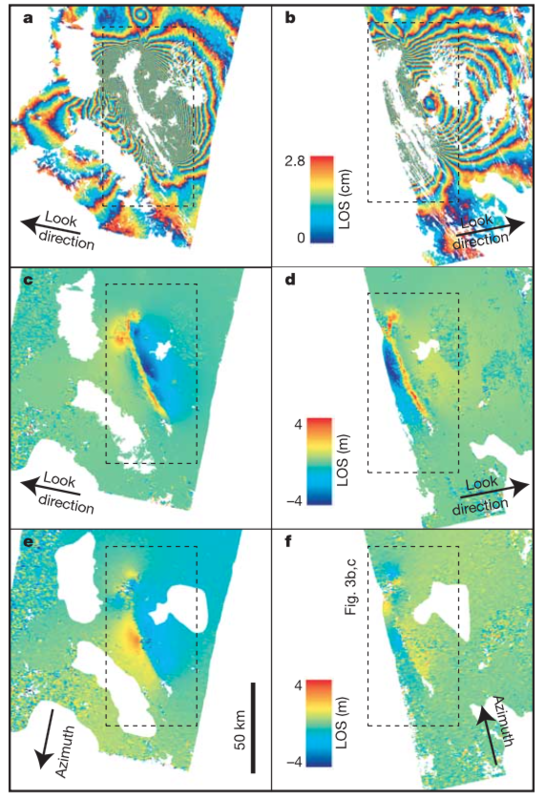 Here we observed the presence of a wide and elongate fissure more than 500 m long and about 60 m deep [(figures 2-4)]. The elongate fissure attains a maximum width of about 100 m where a semi-circular pit has formed and from where the explosive eruption appears to have taken place. This elongate vent is oriented almost N-S [trending N10W] and has broken through felsic pyroclastic deposits and lavas. Two smaller pits were also observed farther N along the fissure [situated] to the N of the major pit. A very fine and light grey ash has been deposited on both sides of the elongate fissure with the ash cover extending more than 500 m away from the vent. Beneath the ash deposit lies a sequence of loose layers consisting of mixed volcanic ash and ejecta from pre-existing fissure wall rocks. These layers have a total thickness of about 20 m near the large pit." Figure 4. A view taken from Da'Ure's (Dabbahu's) new pumice dome looking S down the fissure vent on 16 October 2005, with people for scale. Part of the outer flank of Dabbahu is visible on the right side of the photo; Dabbahu's central area lies farther to the right off the margin of the photo. Courtesy of Anthony Philpotts. At the pumice dome Yirgu noted "... intense degassing is occurring with the production of SO2 as evidenced by its smell as far as 500 m away. Degassing is also visible along the length of the vent as well as through nearby fissures. The local people have reported that on 26 September 2005 at about 1300 local time a very strong earthquake shook the area. This was followed by a dark column of 'smoke' that rose high into the atmosphere and spread out to form a cloud, which darkened the area for three days and three nights. Our field observations were consistent with . . . [a minor ejection] of volcanic ash from a small vent or vents along the opened fissure." "In the same locality, we also studied the newly formed second-order fractures and fissures, most of which were located on the eastern side of the main eruptive fissure/vent. Here, the [roughly N- to S-trending] fractures and fissures were all parallel to each other .... They were better developed on unconsolidated pyroclastic deposits and sediments; they affected an area nearly 700 m away from the main eruptive vent/fissure; spacing is commonly between 10 and 20 m; some extend discontinuously along strike for over 500 m, as observed from the helicopter; open fissures in the pyroclastic deposits measure up to 20 cm wide with common elliptical pits or collapse structures between fissures up to 4 m wide and up to 4 m deep. "We have also observed a major reactivation on a N- to S-trending normal fault located some 500 m to the E of the elongate eruptive vent/opening. This fault breaks through felsic lavas and unwelded pyroclastic deposits and has a reactivated displacement (down thrown to the W) reaching half a meter in places. This reactivated fault extends . . . discontinuously for at least three kilometers as observed from the helicopter. Degassing is occurring along some parts of this fault." Yirgu also said that, according to the AAU Geophysical Observatory, seismicity continued in early October in the area affected by the eruption, faulting, and fissuring. Other data from a 16 October visit. Anthony Philpotts accompanied a team who, along with AAU colleagues, were helicoptered to the eruption site, which had completely ceased by this time. At the eruption site and on the helicopter trip to and from it, he saw no dead nor injured livestock. The team also visited a refugee camp for displaced nomads. In discussions with AAU colleagues who saw the fissure vent during multiple visits, and in comparing photographs, it appeared that material exposed at depth in the wall of the vent changed to a lighter color. Presumably, these color changes were linked to water, initially present but that had evaporated in the intense heat of the Afar day. Philpotts suggested that if the vent did provide a window into the water table, groundwater may have added to the explosive activity. Philpotts said that when they arrived, on 16 October, the pumice dome (shown in close-up in figure 5) still yielded temperatures of 400°C in cracks. The pumice dome lacked any deposits on top of its upper surfaces, and thus clearly represented the last volcanic feature to form. Some post-eruptive faulting was noticed with offsets on the order of 10 m.
Figure 5. Curving fractures in the top of the new Da'Ure (Dabbahu) pumice dome; view looking N. Two people are visible in the photo, one immediately behind the large central fracture. It was from these fractures the boiling noise had been heard the previous week. No sound was heard during the visit on 16 October. Courtesy of Anthony Philpotts. Philpotts made several thin sections of pumice dome samples, and found it to be almost totally aphyric. It contains a very few rounded (resorbed) sanidine phenocrysts (figure 6) and needle-shaped microlites with high refractive index (pyroxene?). He noted that "The microlites undoubtedly formed during emplacement of the dome, but the resorption of the sanidine phenocrysts must have occurred at depth prior to eruption and probably indicates heating of the source magma chamber with an influx of hotter (basaltic?) magma." Figure 6. A rounded, twinned phenocryst of sanidine feldspar in pumice from the Da'Ure (Dabbahu) dome in the center of the vent. Dark circles are air bubbles trapped during preparation of the thin section. The photo was taken with partly crossed polarizing filters; the width of the entire field is 1.62 mm. Courtesy of Anthony Philpotts. Information Contacts: Gezahegn Yirgu, Dereje Ayalew, Asfawossen Asrat, and Atalay Ayele, Department of Earth Sciences, Addis Ababa University, PO Box: 1176, Addis Ababa, Ethiopia; Anthony Philpotts, University of Connecticut, U-45, Beach Hall, Storres, CT 06269, USA; National Earthquake Information Center (NEIC), US Geological Survey, Geologic Hazards Team Office, Colorado School of Mines, 1711 Illinois St., Golden, CO 80401, USA (URL: https://earthquake.usgs.gov/); The Ethiopian Herald, Addis Ababa, Ethiopia. Dabbahu (also known as Boina, Boyna, or Moina) is a Pleistocent-to-Holocene volcanic massif forming an axial range of the Afar depression SSW of the Alayta massif. Late-stage pantelleritic obsidian flows, lava domes, and pumice cones form the summit and upper flanks of the volcano, which rises above the Teru Plain and was built over a volumetrically dominant base of basaltic-to-trachyandesitic lava flows of a shield volcano. Late-stage basaltic fissure eruptions also occurred at the NW base of the volcano. Abundant fumaroles are located along the crest of the volcano and extend NE towards Alayta volcano. 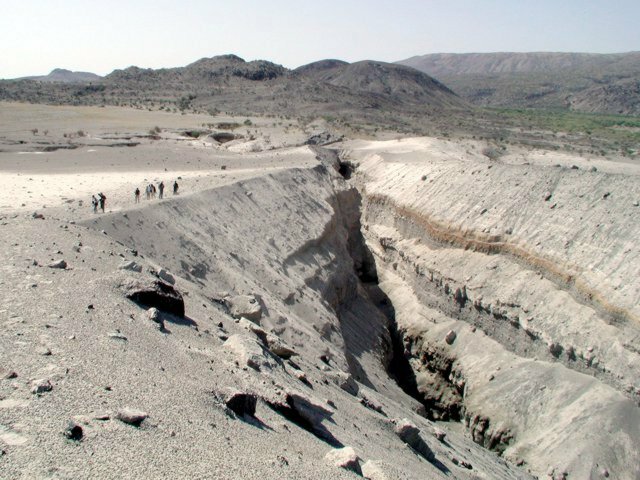 The first historical eruption of Dabbahu took place from a fissure vent on the NE flank in September 2005, producing ashfall deposits and a small pumice dome. More than 6000 people were evacuated from neighboring villages. Barberi F, Ferrara G, Santacroce R, Treuil M, Varet J, 1975. A transitional basalt-pantellerite sequence of fractional crystallization, the Boina Centre (Afar Rift, Ethiopia). J Petr, 16: 22-56. There is no Emissions History data available for Dabbahu. Dabbahu (also known as Boina or Moina) is a young volcanic massif (center) forming an axial range of the Afar depression SSW of the Alayta massif. Pantelleritic obsidian flows, lava domes, and pumice cones form the summit and upper flanks of the volcano. Late-stage basaltic fissure eruptions occurred at the NW base of the volcano (upper left), and numerous fumaroles are located in the central part of the massif. 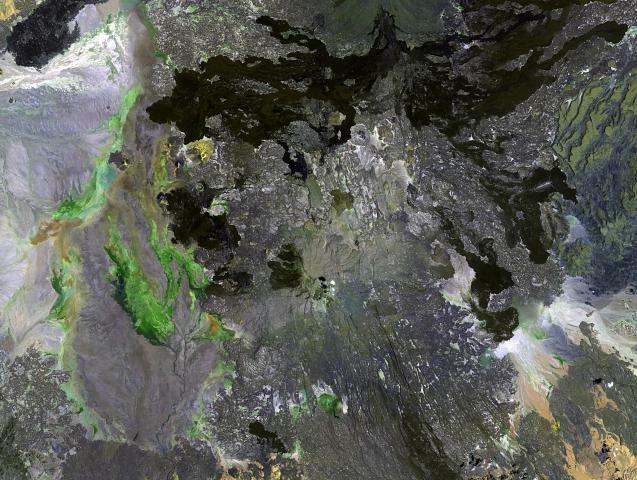 Numerous fractures of the Ethiopian Rift extend SSE from the volcano. An explosive eruption on 26 September 2005, the first in historical time from Dabbahu, took place from a 500-m-long, N-S-trending fissure vent in the Da'Ure area on the NE flank of the Dabbahu massif. A small 30-m-wide pumice dome (upper left) was formed at the northern end of the fissure. The eruption prompted the evacuation of 6,384 people from the settlements of Boyna and Debawo. Photo by Asfawossen Asrat, 2005 (Addis Ababa University). The slopes of Dabbahu volcano in the background are part of a large volcanic massif consisting of obsidian flows, lava domes, pumice cones, and basaltic lava flows constructed over a basaltic-to-trachytic shield volcano. This view from the north with people for scale shows Da'Ure, a 500-m-long fissure vent formed during Dabbahu's first historical eruption in September 2005. 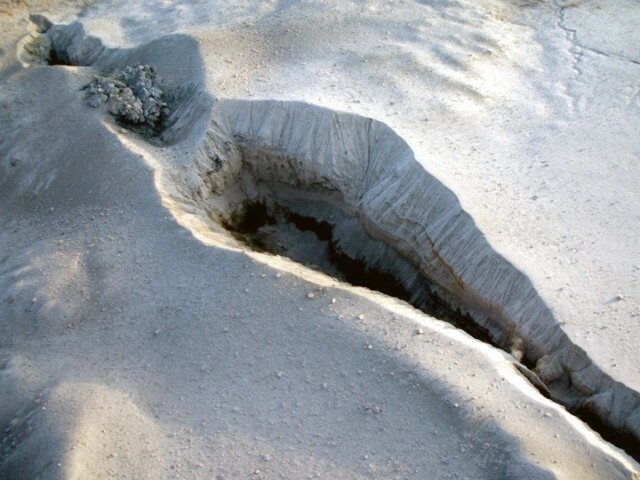 A small pumice dome was formed during the eruption. The central part of the Dabbahu massif lies farther to the right off the margin of the photo. Photo by Anthony Philpotts, 2005 (University of Connecticut). Geologists at the upper right walk along a fracture in a small pumice dome formed during the 2005 eruption of Dabbahu volcano. Curving fractures in the top of the new 30-m-wide pumice dome are viewed from the south. Boiling noises had been heard from these fractures the previous week, but no sounds were heard during this visit on October 16. The dome, not mantled by tephra, was emplaced at the end of the brief eruption in September. There are no samples for Dabbahu in the Smithsonian's NMNH Department of Mineral Sciences Rock and Ore collection. Large Eruptions of Dabbahu Information about large Quaternary eruptions (VEI >= 4) is cataloged in the Large Magnitude Explosive Volcanic Eruptions (LaMEVE) database of the Volcano Global Risk Identification and Analysis Project (VOGRIPA).